...that the Awoken were created from a kugelblitz formed when the Traveler fired a ray of Light at the Darkness as it attacked them? ...that during the Dark Age, some Guardians became Warlords? "Follow the Stranger's coordinates to a legendary colony lost in the jungles of Venus." A Stranger's Call is a story mission that takes place on Venus. Ghost: Our new friend must have access to extraordinary methods to have reached out to us like that. The radio message she sent came from somewhere in the jungles of Venus. The Guardian's jumpship approaches Venus. Ghost: This colony was built by the Ishtar Collective. Records say they once studied ruins older than humanity itself. We thought this was all lost in the Collapse. Ghost: I don't like us getting dragged out here and not being able to get the lay of the land. There used to be a Guardian outpost nearby. Let's see what they have on this place. The Guardian reaches the Guardian outpost and deploys the Ghost to scan a terminal. Ghost: We're linked. Sparrow's accessible. There's a lot here about some war machines called the Vex. Indestructible, relentless, supremely intelligent. And they can teleport. Great. Guardians used to have sensors to track them. Let's get 'em back online. The Guardian approaches the building where the Vex sensors are located. Ghost: The Vex sensors should be up ahead. The Guardian activates the Vex sensors. Ghost: These sensors are extensive. Okay, I should be able to track these machines. Let's head to those coordinates and find out what she wants us to see. The Guardian approaches the coordinates. Ghost: Detecting Vex... like we're surrounded. The Guardian reaches the coordinates. Ghost: The coordinates lead here? What is it? Let me get a closer look. The Guardian deploys the Ghost to scan the Vex Conflux in the center of the room, a tall silvery-white pillar of what appears to be glass. Ghost: Fascinating. A conflux of non-baryonic streams going... where? Vex spawn orbs begin to appear. Ghost: No, no, no, no, no! It's the Vex! Better find some cover! Waves of Vex—Goblins, Hobgoblins, and Minotaurs—appear and begin to attack the Guardian. The Guardian eliminates all Vex enemies. Ghost: What are these things? Are there any still intact that I can analyze? The Guardian and Ghost bend down to get a closer look at a disabled Vex Goblin. The Exo Stranger appears behind them at the top of the stairs. Exo Stranger: We haven't got much time. She begins to walk down toward them and goes past the Guardian, who turns to follow her. Ghost moves to let her pass. Ghost: (adding) Why have you been watching us? Exo Stranger: I don't even have time to explain why I don't have time to explain. (to other party over comms) I will. I will. I know. Exo Stranger: I wasn't talking to you, little light. Ghost: I'm a Ghost, actually. Exo Stranger: Many Guardians fell. Strong ones. But you made it here— (to comms) Yes, I'm listening. They are here with me. The Ghost gets closer to the Exo Stranger and wanders about her. Ghost: Who's she talking to? Exo Stranger: (to comms) Understood. The Exo Stranger looks up and pushes the Ghost away after noticing what he is doing, then turns back to the Guardian. Exo Stranger: You need my help, Guardian. Guardian: Is that why you brought us here? Exo Stranger: They brought us here. The Vex. Evil so dark, it despises other evil. The Exo Stranger walks over to a disabled Goblin still twitching. Ghost: You're not a Guardian. Exo Stranger: No, I was not forged in light. (looks away, then stands) But I believe where our paths cross, ground… could break. The Exo Stranger crushes the disabled Goblin's power core, killing it. The Goblin lets out a short scream as it dies. The Exo Stranger turns back to the Guardian and Ghost. Exo Stranger: Have you heard of the Black Garden? Ghost: We've heard the legends. Exo Stranger: The greatest threat to us all lies there, where these machines are born. Find the Black Garden. Rip out its heart. Only then will your Traveler begin to heal. Guardian: Can you help us find it? Exo Stranger: (shakes head) My path's my own. I can't. 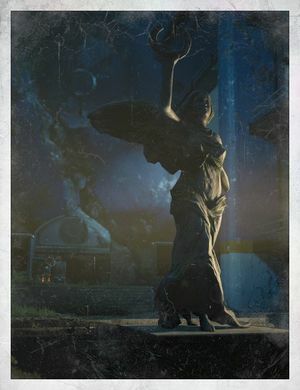 Ghost: (to Guardian) If we're going to find the Black Garden, we need to see the Awoken. Exo Stranger: Ah, yes. The Awoken. Out there, wavering between the light and the dark. A side should always be taken, little light. Even if it's the wrong side. (to comms) Too late, returning. How many? Hold position, kill the engines, and don't let them find you. The Exo Stranger walks away, readies her weapon, and then vanishes in a swirl of scintillating blue-white light. Guardian: So, how do we find the Awoken? Ghost: They live all the way out at the edge of The Darkness. Last place the light touches. Can't we just stay here with the murderous robots? The Stranger's line—"I don't even have time to explain why I don't have time to explain. "—has become a famous meme within the Destiny community, often as a humorous explanation for Destiny's lack of coherent story content pre-Taken King.